No 5 Coach house offers guests a luxury stay set within the tranquil scenic surroundings of the beauty of the kinnoull woodlands. Relax or explore Scotland, only 2 miles from Perth and within 1 hours drive to Edinburgh and Glasgow. 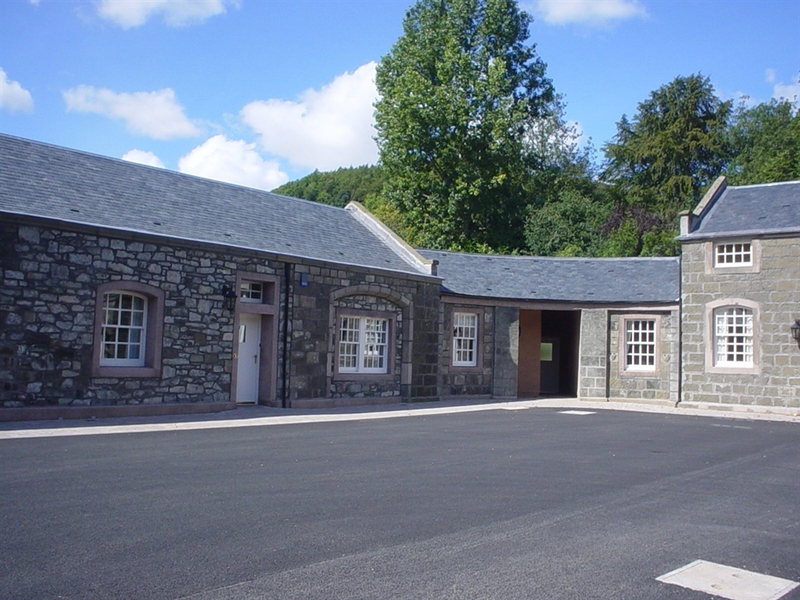 Originally created as stables and coach houses for the 19th century kinfauns castle the traditional stone buill B listed buildings have been restored to compliment the glorious enviroment. The self catering accommodation has been finished to a high standard with careful thought given to guests comfort and enjoyment. No 5 coach house is suitabled for the elderly and disabled, this split level property is easy accessible with parking at the front door. on entering the property there is 1 double bedroom with walk in shower, 1 twin bedroom with ensuite, a large fully fitted kitchen with some work tops and appliances lowered and a separate utility room finnshed of this level. To access on the the lower level there is 3 steps with hand rails,on this level there is a twin bedroom,1 main bathroom with corner bath and shower and a spacious lounge with french doors which opens onto a private enclosed patio area to enjoy the country air and some scottish sunshine. Ideal Central location if you wish to explore Scotland, just 2 miles from Perth city centre ,easy access to all major motorways with Edinburgh and Glasgow both within 1 hours drive away..
On site there is The Kinfauns stables where guests can book riding lessons in the all weather purpose built arena, for the more experienced riders there is hacks available through the kinnoull woodlands. Situated within kinnoull hill there is walks on the doorstep, walk up the coronation road where kings and queens used to travel back and forward from Kinfuans castle to nearby Scone Palace, go up kinnoull hill herself to the famous victoria folly which has one of the most magnificents views over Perth Tay Valley. Perth is renowed for her quallity of restaurants, theatre, concert hall, history, race course and the scenic setting of the banks of the river Tay. Getaway from it all and stay at No 5 Coach house, this spacious accommodation can sleep up to 6 guests, set within the beauty of the Kinnoull woodlands, guests can experience luxury in tranquil surroundings only 2 miles from the centre of Perth. Glasgow and Edinburgh are both within an hours drive. Fantastic walks on the doorstep, ideal for break for everyone including the dog.